The amazing thing about sports is that it brings people together. Sometimes it provides a form of escapism, and other times it serves as a form of relaxation. Eventually, however, a special player comes a long and captivates the audience unlike any other player before. Oregon football fans have had a unique experience the last three years. Not only have they been fortunate enough to watch one of the best college football programs in the country, but they’ve also had front row seats to the best show in town: the Marcus Mariota show. Little did I know, however, that Mariota would put the University of Oregon’s football program on his back and take it to places it had never seen before. These last three years with Mariota guiding the ship have been special. 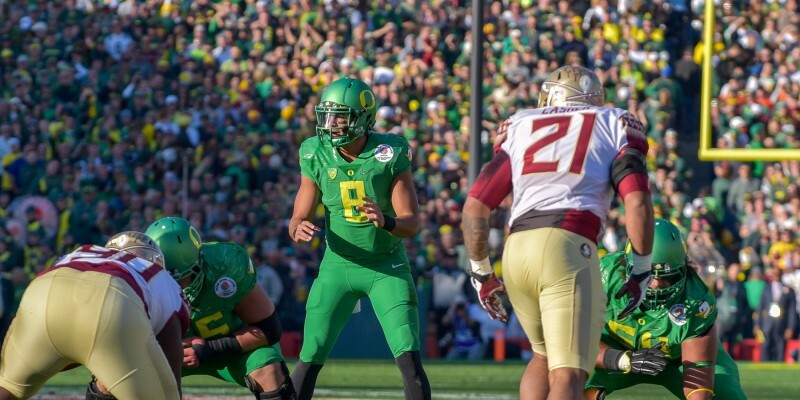 I really didn’t think about this two years ago, but it’s become quite clear to me that Mariota has become the best player that Oregon’s football program has ever seen, and he’s also on his way to becoming one of the best players in college football history. If the Ducks manage to walk out of Arlington, Texas next week as national champions, I think it’s safe to say that Mariota will be in the discussion for the greatest college football quarterback of all time. Think about that. Wow. I’m not sure what the outcome of next week’s national championship game will be, but one thing is certain: anything is possible with Mariota. The city of Eugene knows this already; I think Mariota is ready to show the whole world, as well.